Mrs. Taiye Oyefunke Oguntona was born in Minna, Niger State to the Family of Ibiyeye. She attended the prestigious Ahmadu Bello University, Zaria in 1984 where she obtained a Bachelor of Science (B.sc) degree with honours in Business Administration in 1989. She did her National Youth Service in Lagos with Vanguard Media Limited as a Re-writer between 1989 and 1990. Thereafter she went to the University of Lagos, Akoka for a Master Programme in Business Administration (MBA) in 2001Her career started with the Federal Mortgage Bank of Nigeria (FMBN) as a Finance Officer 1 in 1993 before the deconsolidation exercise of the Federal Mortgage Bank of Nigeria when her service was transferred to the Federal Mortgage Finance Limited where she worked until 1998. She joined the Lagos State Public Service on 15th October, 2001 as a Senior Administrative Officer, GL.10 when she left Faret Ventures. 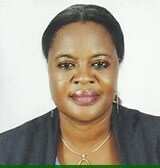 In the State Public Service, she served as Administrative Officer in different Ministries, Departments and Agencies and as a Monitoring and Evaluation Officer in Lagos Metropolitan Development and Governance Project (LMDGP). She was deployed to the Lagos State Environmental Protection Agency in July 2014 as the Director Administration and Human Resource. She is a member of the Nigeria Institute of Management (NIM) a seasoned Administrator and a disciplinary. She is a happily married with children.